On our last holiday, we each carried a rolling suitcase, plus backpack. 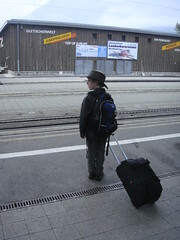 Here is Callum looking very smart while waiting at the train station. But we’ve decided this time that wheeled suitcases are more trouble than they are worth, except when you are on smooth pavements (which is less frequent than you might think, even in the middle of big European cities). 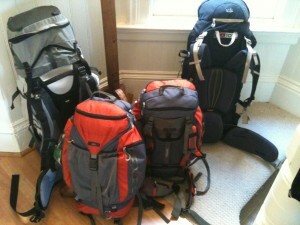 So we’re going for backpacks. After a good half day in camping shops (where the boys were very patient) we ended up buying them each a backpack on line – this one from REI. They’ve put it on, and filled it with all the clothes they are planning to take, and pronounced them very comfortable. I was surprised at how little they weighed – 4.5 kg each. This guideline suggests that children should carry a maximum of 15% of body weight. That means that Declan might be carrying a little too much, but only slightly.